Design a rectangular combined footing to support two columns shown above. The edge column on the left has a section of 16” x 16” and carries dead & live load of 175 kips & 110 kips respectively. The interior column has a section of 20” x 20” & carries dead & live load of 220 kips & 120 kips respectively. The allowable soil pressure is 5.5 ksf (kips per square foot) and the bottom of footing is 5 ft. below the final grade. Using f’c = 4 ksi & Fy = 60 ksi. Design the footing using ACI Strength design method. Step 1: Locate the resultant of loads ‘R’. Taking moments about center line of left column. The distance of resultant from property line. Now resultant of applied loads coincides with resultant of upward soil pressure. Total applied load = 175 +110 + 220 + 120 = 625 kips. We have chosen a footing with the length of 21.41′ and width of 6.5′, giving an area of 139.165 sq.ft . 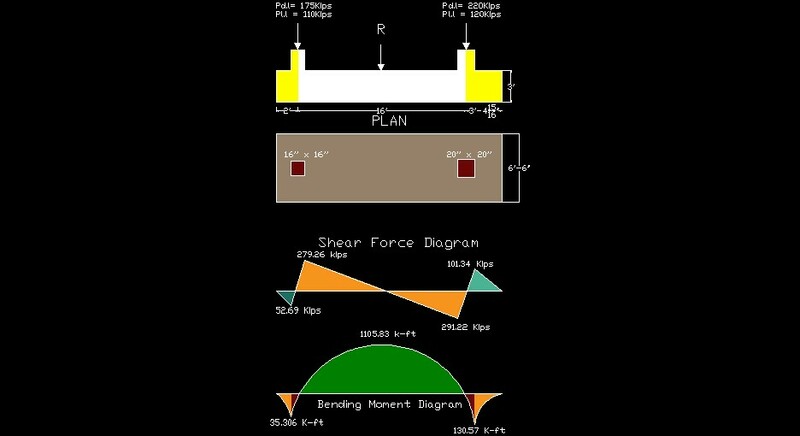 So, Shear force diagram can be plotted. Now locate a point of zero shear. Compare similar triangles or write a generalized shear force expression for mid span and set it to zero. M = + 1105.83 K-ft.
Now we will check the depth of footing for one way shear and two way shear. From shear force diagram, maximum shear occurs at the critical sections, located at a distance ”d” from the interior face of right column, as shown in the loading diagram above. Hence, depth of footing is adequate against one way shear. Two way shear or punching shear can be determined from critical perimeter b0. b0 = 17.17 ft. C + d = (20 + 31.5) / 12 = 4.29 ft. The Depth of footing is adequate with respect to two way shear or punching shear. Mu/Φbd² = (1105.83 x 1000)/ (0.9 x 6.5 x 12 x 31.5²) = 190.51 psi. As min = 5.05 in. These bars are extended between the columns at top of footing with concrete cover of 3” as place minimum reinforcement corresponding to temperature and shrinkage reinforcement, corresponding to minimum area of 5.5 in². Use (7 #8 bars) they provide an area (As = 5 in²). 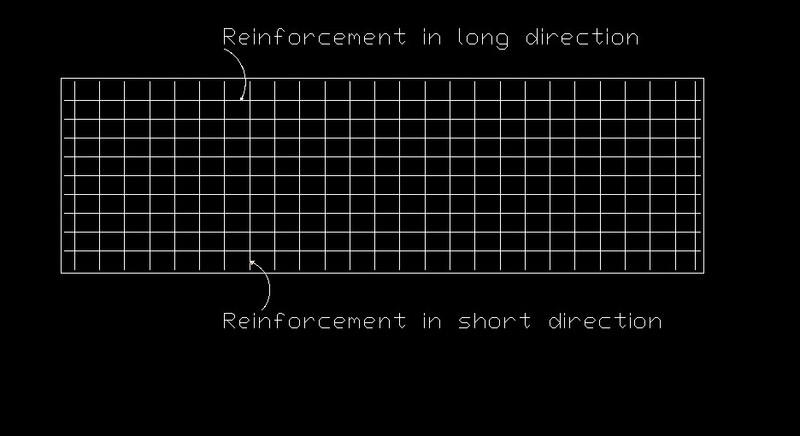 Place this reinforcement at the bottom of projecting ends of footings beyond columns to take care of positive moments (see the bending moment diagram). Extend these bars by a development length beyond sides of the columns. Reinforcement in the short direction. Now calculate the bending moment in shorter direction. The reinforcement under each column is to placed within a maximum band width equal to column width plus twice the effective depth of footing. Mu at the face of left column. = 59.38 x (1.33)²/2 = 52.51 K-ft.
Mu at face of right column = 70.15 x (2.57)²/2 = 231.66 k-ft.